England completed a second win over a Bangladesh Cricket Board XI, with fifties from captain Alastair Cook and Matt Prior seeing the tourists home. The recalled Ryan Sidebottom and Tim Bresnan took two wickets apiece, as did spinner James Tredwell, as the hosts made 151-8 from their 37 overs. England reached their target with 7.4 overs left in the rain-shortened match. 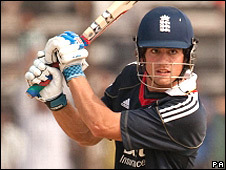 Cook retired on 52 and Prior scored 64 not out, but there was another failure for Kevin Pietersen, who made only six. Cook's 51-ball innings contained eight fours and a slog-swept six, but Prior's knock was perhaps a more significant one, with Craig Kieswetter being handed the wicketkeeping gloves for the first time. Kieswetter hit 143 on his full England debut against the same side on Tuesday meaning Prior was under pressure to provide a reminder of his own batting talents, and he did just that, hitting nine fours from 56 deliveries. Eoin Morgan fell for nine after being bowled by Mahmudul Hasan reverse-sweeping, but Luke Wright ensured there would be no collapse, ending with 20 not out from 16 balls. Earlier, Sidebottom and Bresnan opened the bowling for England and soon set about dismantling the BCB top order. First Bresnan had Siddique caught by Tredwell with only 14 on the board, then Sidebottom claimed the scalp of Test cap Shahriar Nafees, held by Pietersen for eight. Aftab Ahmed (12) came to the crease swinging, hitting a four and a six before Bresnan had him caught behind by Kieswetter. Imtiaz Hossain lasted just two balls before being trapped leg before by Sidebottom as the BCB limped to 36-4, before Raqibul Hasan was caught behind for 19 off the bowling of Liam Plunkett. Kent off-spinner Tredwell dismissed Mahmudul for 15 and cleaned up Mashrafe Mortaza for a duck, before Tanveer Haider and Alauddin Babu put on a game partnership of 55 for the eighth wicket. Ajmal Shahzad ended the fun, having Haider caught by Cook for a sensible 35, but Babu persevered, his 43 not out taking just 52 balls and including five boundaries.